Sources have confirmed that in gun shows from other parts of the country firearms that are desirable, or valuable such as antiques somehow avoid the grinder and make it into the private collections of the police officers running the scam. Not to impugn any department specifically or to say this is a general practice, only that it happens more often than one might think. Our contributing writer, Dean Weingarten, gives us a breakdown of what happened at the York PA gun buyback that occurred on October 28th. There were about 20 handguns, mostly old revolvers, turned in. At least one Colt revolver and a Smith & Wesson or two were included in the handguns turned in. Their value would have been about $400 to $600 each. A Ruger MKI .22 was turned in. They are worth about $250. One of the guns turned in was a starter pistol. I have been unable to identify any of the long guns, other than a single barreled shotgun and a .22 rifle. Some of the long guns appeared to have broken stocks. 100 gift cards had been purchased from The Villa shoe store. The money came from the York County District Attorney’s office. That would be $5,000 dollars. It seems a little strange to purchase gift cards from only one store. It is the equivalent of giving a store money. It’s one thing to turn in a rusted, broken, hunk of metal that used to be a gun for $50. It’s quite another be bamboozled by the police into trading in a $600 Colt revolver for less than 10% of its worth. Of course, while it is on the seller to be aware of what they are doing and their ignorance is no excuse, the fact that the police are actively involved in exploiting the uninformed is unsavory to say the least. And what kind of mindset are the York Police exploiting at this gun buyback? The kind exhibited by Jim Seabright who turned in his .22 Ruger pistol. Then you have another bed wetting gun-aphobe who turned in not only an antique shotgun but a family heirloom because it made him soil his pants when he inherited it. Marvin Wallace, also of York, turned in his grandmothers shotgun. It had been bequeathed to his sister and upon her death was given to him. Wallace actually showed up to the York police station a few days before just to give them his family’s shotgun. They told him to come back at the event. I can only assume less paperwork that way and as such, someone with nefarious motives in the department can make off with a antique shotgun for free. Oh, you think gang bangers are lining up to turn in their burners? The naivety and abject stupidity of people like Marvin Wallace is frustrating. The willful ignorance and the complicitness of their own exploitation is enough to turn my stomach. 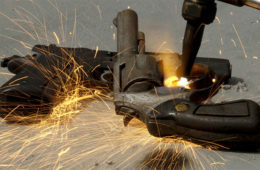 All told the York gun buyback netted only 36 guns during the two hours it was operating. I do appreciate the entrepreneurial spirit of one enterprising individual who stationed himself next to the firehouse holding a cardboard sign that read, “Consult Me First,” in an effort to attract gun owners who might actually get a fair price for their firearm. Unfortunately with gun control zealots like Wallace and Seabright it didn’t seem like anyone took the gentleman up on his offer. If you are a enterprising pro gun kind of person than I recommend that you do the same when you find out there is a gun buyback program happening near you. I mean, a One Hundred Dollar Bill beats out a $50 gift card every time and it could net you a $600 gun. Either keep it or take it to a gun shop and selling it for $300 and triple your investment. Not only do you make a deal for yourself, you help out the hapless gun seller as well as the taxpayers who don’t have to pony up that $50 for this scam that doesn’t benefit them in the least. Long story short, gun buybacks are scams. They don’t “take guns off the streets” they prey upon the uninformed to turn in valuable property for next to nothing. Do not support this fraud and fight against your municipality if they want to waste you tax dollars on it.